The artwork of Stano Masár represents the flow of contemporary art, which is based on the premise of conceptual art in which the idea is superior to the materialization of the piece. It represents a situation where art is primarily the author's gesture. He refers to the essence of conceptualism ("art is an idea") and at the same time emphasizes that the aesthetic category bearer can become any subject of ordinary reality through the author's intervention / gesture. This is evidenced by the system of the artist's creation and its resulting forms – the works centered on the emporas of the synagogue belong to the ready-mades category (objects of ordinary reality, naturally or industrially made, appropriated by artists) that he changes by his own intervention. The definition of this method of creativity may sound too strict and academic, but it is also determined by the other feature. It is an attempt to disturb the original function of ordinary objects, which the author "improvises" with his interventions. It is not just about the use of the Marcel Duchamp‘s gesture, namely adding an aesthetic category to a common subject (even by transferring it to the exhibition space), but especially by changing their nature and purpose for what they originally served. The doors, tables, chairs and others... acquire their own autonomy, a new form of existence that is disturbing and questioning everything we know about them – as we usually (do not) perceive their ordinariness. Stano Masár presents them as things that – in a figurative way: "they can not, do not want or can not live in their ordinary being and they are looking for their new form." At the same time they playfully and humorously emphasize their ordinariness – by underlining the properties and parameters that belong to them, but otherwise – without the author's intervention, they are so inconspicuous that we do not notice them. Part of his presentation is installation / action Blind Archive, which refers to another to another line of his artwork. It is devoted to so-called Institutional critique, where the author is interested in the another – reverse side of a common art / gallery presentation. 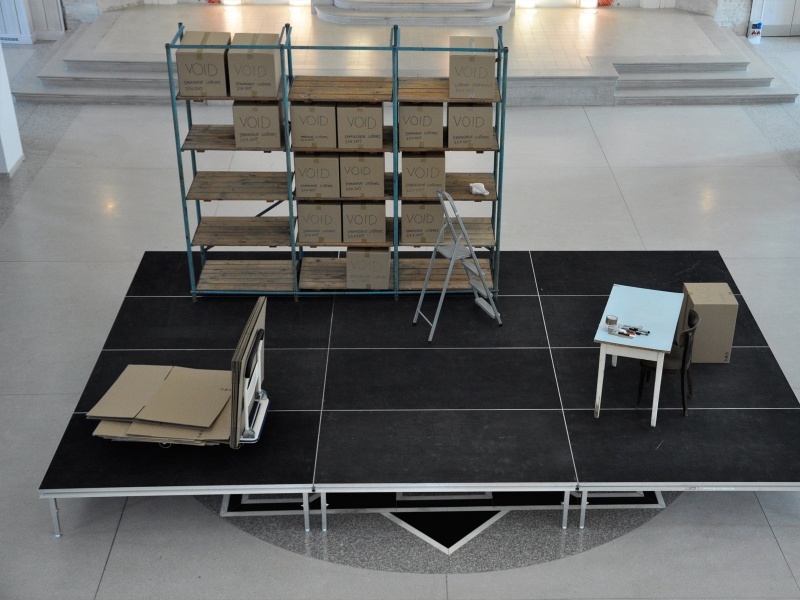 In this case, a gallery inventory used for installation (ladder, cart for transporting the artworks, etc.) is the actor-holder of the artwork status, but also a fragment, resp. entire exhibition space as such. The artist points to the reflections on what determines the essence of the work and questions the duration and temporality of the work. He turns similar considerations to the exhibition space: the factor of its "fulfillment by artworks" may not be the main feature that characterizes it as a place for the presentation of visual arts. Using his own optician it can also be emptiness. Blind Archive (and works on the ground floor of the synagogue) are a response to the layout of the exhibition space: they are not only respecting its givenness, but at the same time they are trying to create a certain synergy – by grasping and interpreting the "emptiness" of the hall that the building frames. "Packaging of the emptyiness" is also the gesture of the author, who "materializes" emptiness and he shifts it into the form of an atypical ready-made. At the same time, it is a sample of site-specific work that responds to the character of space. If we develop this author's strategy in connection with the broader, and in particular the historical links associated with the synagogue, the focus of furniture-based author‘s works reminds and comments the fact that the building during the World War II served as a warehouse for such housing inventory coming from the plundered Jewish flats of Lučenec and the surrounding area.